We discovered this wonderful pair of figures at the Heartland Antique Show in Richmond, Indiana in the middle 1990s. They had been brought to this nationally recognized show by a antique dealer from Iowa. 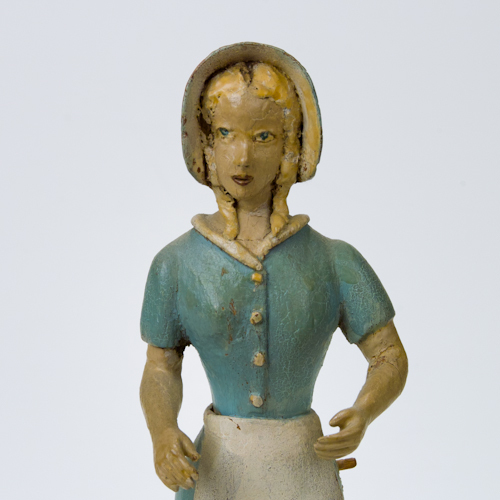 She did not know the figures provenance but said she believed them to be from the late 30s to early 40s. They are delicate and beautifully carved with great skill exhibited in technique. The attire is well articulated, the man holds a hat behind his back. The hat must have been broken at some stage as it had been carefully glued together at the time of our purchase. The woman’s shoes have some loss of the black paint. She is also missing what we believe must have been a basket which rested upon her left hip. There is a small peg which juts from her hip, some absence of paint makes it apparent something had been applied and then painted. Her flaxen hair and some of her facial features have been sculpted from a composite material. Perhaps glue and sawdust? 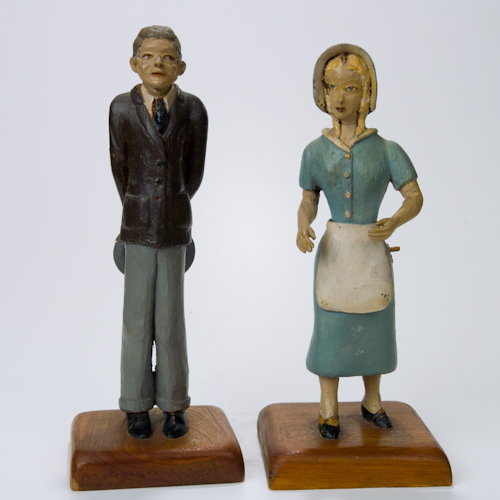 Both the male and female figure stand on their original stained bases, each approximately 4″ x 4.5″ x .5″ tall. The figures each stand approximately 10″ tall on their bases. 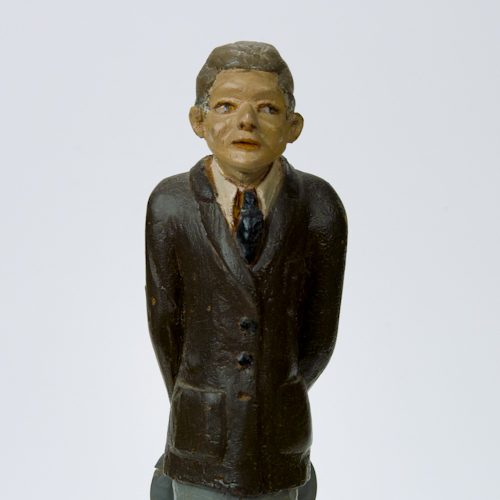 Scribed in pencil on the bottom of the male figure’s base is “Seale,” nothing further was discovered about their origin.